This is a great idea for a summer lunch or a light supper, but it could equally make a good side dish for a barbecue or picnic. 1. Preheat the oven to 200°C, gas mark 6. Peel and halve the squash, scraping out the seeds. Cut into 3-4 cm pieces. 2. Mix the squash with the onion, thyme, garlic, olive oil, salt and pepper in a roasting tin and place in the preheated oven for 30-40 minutes. 3. 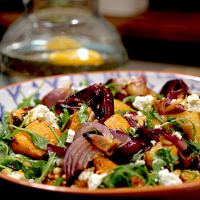 Tip into a large bowl and allow to cool slightly, then mix through the rocket and feta. 4. Cook the cous cous according to the packet instructions, replacing the water with chicken stock. 5. Fork through the cous cous and stir through the parsley, coriander, cherry tomatoes, chopped shallot and the almonds. Drizzle with honey and a squeeze of lemon juice. 6. Drizzle the lemon and extra virgin olive oil over the salad, scatter with the pine nuts (if using) and serve warm or at room temperature with the cous cous.